The Bosch GBH2000 110V SDS Plus drill is a 3-function tool that is both versatile and reliable. An overload clutch keeps you and the machine protected on the job and the device is supplied with an auxiliary side handle with a rubber coating for comfort when in use. There is also a depth stop for accuracy and precision while you work, and the tool is fitted with replaceable carbon brushes for easy maintenance. The Bosch GBH2000's compact design and accompanying carry case make transportation and storage simple too. Max. drilling capacity in masonry 20mm, wood 30mm, steel 13mm. No. load speed: 0-1300rpm. Max. impact energy: 1.6J. Max. core bit size: . Overall length: 325mm. Weight: 2.3kg. Includes Plug. GBH 2000, auxiliary handle, 210mm depth stop and carry case. Bosch GBH 2000 Corded SDS Plus Drill 110V is rated 4.8 out of 5 by 20. Rated 5 out of 5 by DougiePumpkin from What a brilliant Allrounder As the title says .. Used this for removing tiles from 2 bathrooms and chasing pipe workout. The sds drilling is as expected but for such a small drill the chisel function was great and the price was fab .. Rated 5 out of 5 by BIGred147 from Good but unreliable This SDS drill worked fine for just over one year and I could have no complaints about its performance . Unfortunately it stopped working just after a year so I sent it back to be fixed by Bosch under their three year warranty . That was 6 weeks ago , I have not yet received any word back as to when it will be returned fixed or otherwise . Extremely disappointing service from a reputable company which is why only 1 star for reliability . Rated 4 out of 5 by NottsBuilder from Excellent Hammer Drill! Used this drill for the first time today just for general ripping out on a bathroom and it made quick work of the tiles, much easier than using a hammer and bolster! Very little vibration and no achey arms, Fantastic! The only reason it recieved 4 stars on the features is thatr i think it should have a speed setting but its a very small issue. 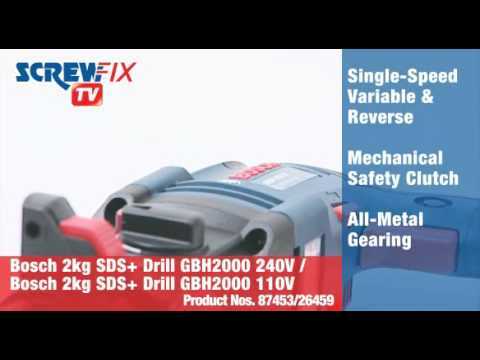 Rated 5 out of 5 by Chrisbfromwalsall from Bosch 110v SDS We have purchased several of these drills for our sparkies over the past couple of years and they are proper work horses. I have owned one for about 12 years and still going strong. from core drilling to small masonry drilling dose the lot, and the rotor stop action is fantastic for nibbling away at brickwork. Rated 5 out of 5 by Duncan4TCrewe from Super value Excellent product at a very competitive price. Most guys on our site are using this tool and we all agree. Rated 5 out of 5 by GeneralRefurbishments from Good drill for money Not bad at all. Quite reliable tool. I use to have different makes sense and this is the best so far.